While regional riding champions Robert Thompson and Greg Ryan carry the overwhelming support of punters on most favourites at Monday’s Tamworth TAB meeting, wily Scone veteran Stephen Jones typically offers value. Thompson and Ryan have a dozen rides between them throughout the regional seven-race TAB meeting and most are short enough. Particularly with Thompson who has long passed four thousand career wins and rides four well- credentialed Allan Denham charges most dominant in betting markets. The veteran marvels also ride for other profile stables of Rod Northam and Sue Grills. The widely travelled Jones returns from a trip to the Gold Coast with a degree of confidence in four runners at lengthy odds as he relies upon lesser profile former Queensland jockeys Jackson Morris and Skye Bogenhuber to upset the Hall Of Famers. Stephen Jones. Credit: Bradley Photos. Bogenhuber, who has linked with Brett Cavanough at Scone, has won several Toowoomba premierships. Earlier in the season she won a Group Two sprint at Caloundra on Cavanough’s stable star The Monstar. Jones continues his long association with prolific racing breeder and entrepreneur Gerry Harvey. They combine at value with Morris on lightly raced prospect Palais De Louvre in the Craig Martin uses Hygain NV1 Maiden (1400m). 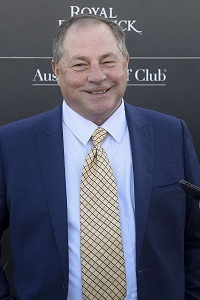 Jones believes his three-year-old filly Ain’tabay can be a major improver in the Dennett Racing uses Hygain Feeds Maiden (1200m) to be ridden by Bogenhuber. Consistent Revere is Jones’ best on the day to be ridden by Morris in a Luke Morgan uses Hygain Micrspeed BM 58 (1600m). Jones winds up the day with Harvey bred and owned Herzegovina in the Sue Grills uses Hygain Feeds Class I (1400m). View the fields, form and race replays for Tamworth's Monday meeting here.